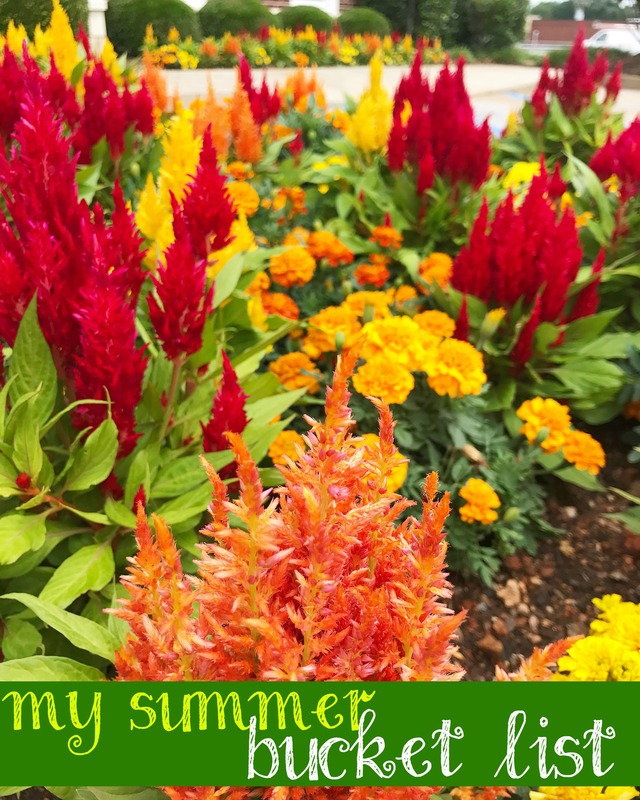 Earlier this month I talked about creating a summer routine. Even though my daily schedule is the same all year long, I still like to create a bucket list of goals and ideas for the season. I thought of some new things I wanted to work into my summer and came up with a fun list. Here it is! Family gatherings around the 4th are a tradition, so we hope to do it up big as usual. Our town has a fireworks display on the 3rd, so we are open to go elsewhere on the 4th. My sister’s health issues have led to multiple surgeries this year, and she’s looking at (at least) one more later this summer. So praying she heals up already! It would be a wonderful way to end summer with her healthy again. Mom and I are trying to grow a few things in the garden this summer. Fresh green beans are awesome….yum! And a family friend is having a baby shower in August. Busy couple of months ahead! I did an at-home workout routine a few years ago that I enjoyed…with both the AC and the ceiling fan running! 🙂 I’m so sorry your sister still isn’t doing well, I will keep her on my prayer list. Hugs! A/C and a fan are very vital for summer workouts! 🙂 Thank you so much for the prayers for my sister!! It’s been a rough road, but we have faith that things will improve….hopefully sooner than later! Just found your blog it’s really cute. Have fun at ASL class, it is such a wonderful language to learn. When I was in college I was part of their pilot program for sign language interpreter degree. Loved every single minute and class! So glad to have you here! We are really looking forward to the class! Love your ice cream goal! Ha! That should be on mine too. We have been trying to eat less ice cream and choose healthier snacks and desserts because we all love it and would eat it every day if we could! Dale Jr.’s final race. Oh my goodness, that would be the BEST ever. Love your list. We love racing at Bristol anyway, so I’m looking forward to it! The end of an era! Love your list. I need to make ours. I am really hoping to stick to good eating too! It will be harder for me during summer than any other time, so I’m really trying to focus on it! Fun list! Love that you’ve got a good mix of couple activities, family fun and parties! You’ve got a lot to look forward to in the coming months. Hope your AC is cranked up high!! We’ve already had to turn ours on a time or two which makes me a little nervous for a HOT summer. Our AC has been on since March, but thankfully we haven’t had to run it as much as we usually do! I just saw an article that said the South is in for one of the hottest summers in a long time. Oh boy. I’m so glad I’m not the only one who dreads summer! Fall and winter are my favorite. We’ll be at the race!!! Yay!! Yes, Bristol is probably the best track for a first-time race. It’s my favorite. Just brace yourself, it’s VERY hot until about halfway through the race when the sun goes down.